Kyria Aluéla – Melchizedekia – The Vocal Alchemist – Messages of Love & Wisdom, Light & Sound-healing, Soul Codes, Vocal Alchemy, Music, Merkaba Lightbody Activation & Teachings, Ascension & Metaphysics Seminars, Art, Events, Sacred Site Tours, Channelings from Masters ******* Botschaften der Liebe & Weisheit, Licht & Klang-Heilung, Seelencodes, Klangalchemie, Musik, Merkaba Lichtkörperaktivierung, Aufstieg & Metaphysik Kurse, Kunst, & Reisen zu Energiezentren, Channeling der Meister. Spiritual Medium, Vocalist-Composer, Vocal Alchemist, Sound-Light healer, Intuitive Life Coach, Twin Flame advisor, Shaman, Channel, Metaphysical teacher, Artist, Photographer, Author, Motivational Speaker, Ceremonial & Tour Leader. Priestess of Melchizedek & Universal Ministries. Spirituelles Medium, Sängerin – Komponistin, Gesang Alchemistin, Klang-Licht Heiler Intuitiver Lebens-Coach, Zwillingsflammen Beratering, Schamanin, Channel, Metaphysische Lehrerin, Künstlerin, Fotografin, Autorin, Motivationstrainerin, Zeremonien Meisterin, ordenierte Priesterin des Melchisedek Ordens und Universalen Ministerien. ‘Kyria Aluéla Lumina has studied with wisdom keepers and masters of many global and galactic traditions. She is initiated into the higher orders of Melchizedek, Enoch, Metatron, Sirian and Orionis galactic councils. A Buddhist Lama gave her the name Tensin Droelma, meaning: “Truth holding Liberator”. Always in search of truth and with the feeling of having a mission to help others by being a messenger, in her earlier years she worked as a photojournalist in USA and Europe. She has traveled the world to study the different cultures of our planet to realize that in our hearts – WE ARE ONE. Love is the glue that holds us and all matter together. Everything in the universe is connected and in relation to each other. The Mayans say: IM LAKESH, which means: I am another you. She is dedicated in spreading unconditional love, truth and the frequencies needed to transform humanity to the next divine stage of its evolution on earth. In her teachings she fuses all knowledge together in her own exciting, humorous and compassionate way. She teaches consciousness expansion and spiritual awareness, guides group healings, meditations, vibrational toning groups and does private consultations. Kyria’s vocal music art is her path more and more now. Her multi-octave voice, which is beyond 5 octaves, is magical and mystical. Her voice becomes an instrument of the Divine. The sounds she transmits are of another World – the realm of sound as well as of many cultures of the earth and stars. She chants sound effects of Nature, Animals and Spirits which one can hear at this time on sound cloud and myspace ( below). She chants the Voices of the Ancients as she hears them and they sing through her. Kyria Mystica also hears the sounds of the music of ancient sacred temples, ruins, places in nature, of the stars and other beings of distant planets in her mind, which she channels through her voice. She sings in the Language of Light – the cosmic language of sylables and vibration. This is the language before all other languages where created. Kyria Alu’ela intuitively knows what sound a client needs to remember who they truly are inside and which sounds will unblock, liberate and assist in the self-healing process of a person or other living being. Sound bypasses the rational mind and reaches the soul. The Soul is like a crystal or Diamond. Sound is a fast and powerful tool for transformation and healing. The physical body is made up of sound vibration and light as well, and reacts quickly to sound for healing. The higher self and soul understands sound and sends a signal to the body when the correct sound keys are installed into the Lightbody and Aura, which then harmonize all bodies – The physical and the lightbody. Kyria Aluéla sings and channels through her 6-7 octave voice, your own unique SONG OF YOUR SOUL and DIAMOND SOUL CODES in sound and a divine cosmic syllable language of light, like tongues, which awaken you and connect your body and mind to your divine self – your soul. Each person has their own soul vibration signature in sound. This means when you get these sound codes transmitted to you, they burst your traumas and blocks appart, like putting a pin into a balloon and then they awaken your inate soul wisdom, rewire and reprogram you. This all happens almost magically. You become transformed and feel renewed. You become in tune with your soul purpose and can attract all that is good for you. ( see more info by clicking the link below about Soul Codes). Kyria Aluéla aka Kyria Mystica’s voice and music is amazingly powerful in touching and opening peoples hearts. It lifts them into a higher level of consciousness within a few minutes. Her audiences at events and concerts feel a shift and healing taking place. “She fixed us up” ;”I felt things melting off my body”; “You touched my soul”; “I cried for joy”; “Somehow my Soul understood this language”; “I feel more at peace”…. Kyria’s sessions are powerful, yet lovingly gentle incorporating holomatrix healing with light and sound. She works with many higher dimensional masters, angels and personal spirit guides and of course the soul of Jesus – Sananda as well as Buddha and God directly. She assists in harmonizing body, mind and spirit by assisting in releasing old wounds, non-serving thought patterns and painful emotions through transmission of divine energy, sacred codes, holographic healing and channeled vocals which she calls, “The Song of Your Soul” or SOUL CODES, as each person has a unique sound that will awaken the person to their divine soul. Every person receives unique sounds and channeled messages and affirmations. She can connect with loved ones on the other side and personal spirit guides to give her clients a message. At the end of a session, everyone feels lighter, more peaceful and reconnected to their true inner core, higher self and the source of creation. “Kyria transmitted my Soul Codes (Ascension codes) which has helped me in being more aligned with my soul purpose”. – Bhavna S.
– Bhavna said to me, she saw sacred geometry and Yantras coming into her pineal (3rd Eye), and heard messages spoken to her higher-self in the light language, which the higher self understood during the session. She said to me when I followed up with her a week later, that she felt much more coming into her crown chakra and 3rd eye for many days after the transmission with me. She told me also that they helped her with her own healing work with her clients. “My session with Kyria has lead me back to myself. I needed a little push of energy to help get me back in alignment and to help with my transformation at this time. Thank you again Kyria for the beautiful session we had together “. – MA ( Holographic Healing & Sound Transmission of Soul Codes ). “Kyria’s session was palpable and dynamic. As she began the clearing process, I became aware of the subtle bodies releasing, expanding, becoming lighter with each wave of light and sound that moved through me. The initiation and chanting of the Soul Codes allowed me to move into recognizable depths of memory and remembering; tapping into a deep inner peace of knowingness, cosmic embodiment and connection”. – Heather W.
and include your phone, gmail account, google hangouts, so she can contact you. Kyria Alu’ela now also offers guidance, if you are not sure how to connect with your Twin Flame or need help understanding this concept or have difficulty with a person you think is the person embodying your twin soul, you can receive assistance by booking a session with Kyria Alu’ela Priestess of Melchizedek, who understands the process well through her own experience. She also gives you tools to connect with the Twin Flame Soul, such as a chant and more. There also are Twin Flame Codes. Only serious requests will be replied to. 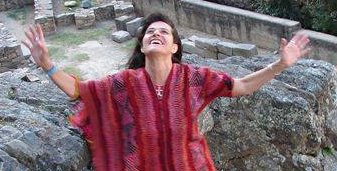 Kyria leads sacred site tours and retreats starting in 2017 to Sacred Sites and Power Places in Peru, Mexico, Greece-Turkey, Portugal and Egypt where she has personal connections to major spiritual leaders, shamans, archeologists, tour agencies and guides. She offers tours combined with seminars and Retreats with other facilitators. To be announced in 2017. Kyria teaches Lightbody activation for Ascension and Holographic Healing, as well as the ‘Intuitive Voice’ Classes where one learns to access ones own Soul Voice through chanting. You can organize a class for groups and invite Kyria to your center or home. Call or write her. Kyria Aluéla is a facilitator of the Melchizedek Method TM Merkabah teachings levels 1- 5.1 since 2000. These wisdom teachings are the most up to date spiritual technologies using the Flower of Life Holograms, Sacred Geometry and Alchemy of Love for consciousness expansion and healing. 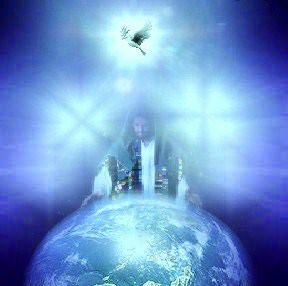 This is what we now need for ascension passed to us from the Melchizedeks, Thoth, Enoch, Ascended Masters, Sananda, Galactic Councils, Gaia and YHWH. The OM-KABAH is the newer more advanced version of the MERKABA. Its includes many color rays, the sound of OM, new DNA activations, Metatronic light codes and other tools to ascend. The ADAM KADMON is the name of our Human blueprint of God’s creation. It is a rainbow Lightbody made up of colored light and sounds. It is time NOW – we need to activate our Omkabah, to become a 5th Dimensional Ascended Human and access higher consciousness of multi-dimensionality. Melchizedek Method also teaches a Holographic Healing system which the participants become certified as practicioners by the Kamadon Academy. Kyria is a vocal channel of sound where she accesses the higher consciousness of souls, earth, other planets, animals, plants, minerals and buildings. She facilitates chanting classes and meditations in which she guides other with specific chants and other tools to access their own soul voice. This is a natural, intuitive form of voice work, not like the classical training in vocal music. *One can book a 1 – 2 hour private session for this as well or share the hour with a friend. Email me first and include your phone, skype or google account, so I can contact you. who records her channeled vocal music and gives concerts. Her music is a blend of sounds from all over the world and cosmos. She sings ancient chants, ethnic melodies and cosmic tones from the stars in star languages or the language of light – the language of GOD. Melodies in many voices and sound vibrations flow through her voice spontaneously as she creates her own compositions in the moment. She mesmerizes and heals her audiences, since sound vibrations by-pass the rational mind and reaches the heart and soul. The soul understands the language of music, since it is vibration in its nature. Kyria improvises and records with top musicians. The voice of “Kyria Mystica” can soon also be heard in films. Her CD will be released in 2019. This name was given to Kyria Aluéla from the Melchizedek Masters of Light. It is to be our UTOPIA – a realm or place of Love, Truth and Peace. 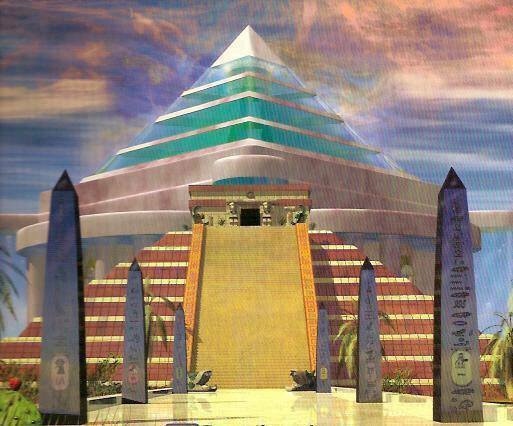 It is the 5th dimensional New Earth Star where the New Human of Light or as the Incas call it “HOMOLUMINOUS” lives with more expanded capabilities than the Human of the 3rd dimension had. It has a new society of love, fairness and truth. “…A Brotherhood of Man – Imagine there are no possessions….Imagine all the people sharing all the world….and the world will live as ONE”. Melchizedekia is also a Facebook community – for Spiritual Science and the secrets of creations, as well as Ascension Teaching of the higher dimensional Masters and divine lightworkers and teachers on Earth. 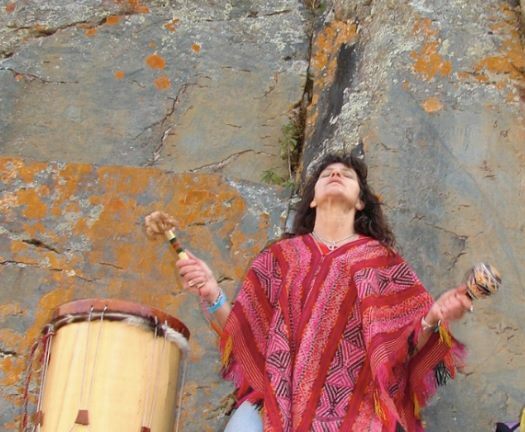 Kyria Aluéla enjoys traveling internationally to present her sound work and Lightbody Ascension Teachings in English, German and in other languages with a translator. She is also available to teach sound mediation, do healing sessions and perform in concerts. If you would like to invite her for your centers or a group, contact her below. Email Kyria with all your contact information such as email, telephone or Skype name. She will then contact you for further details and how to book a session or classes. Spirituelles Medium, Sängerin – Komponistin, Gesang Alchemistin, Klang-Licht Heiler Intuitiver Lebens-Coach, Schamanin, Channel, Metaphysische Lehrerin, Künstlerin, Fotografin, Autorin, Motivationstrainerin, Zeremonien Meisterin, Priesterin des Melchisedek und ist ordiniert durch der Universalen Ministerien. Kyria Aluéla Lumina – hat die Weisen und Meister der vielen globalen und galaktischen Traditionen studiert. Sie initiierte sich in die höheren Ordnungen des Melchisedek, Enoch, Metatron, Sirius und Orionis galaktische Räte. Ein buddhistischer Lama gab ihr den Namen Tensin Drölma, was bedeutet: “Wahrheitshaltende Befreierin”. Immer auf der Suche nach Wahrheit und mit dem Gefühl, die Aufgabe zu haben, anderen als ein Bote zu helfen, arbeitete sie in ihren früheren Jahren als Fotojournalist in den USA, Deutschland und Europa. Sie hat die ganze Welt bereist, um die verschiedenen Kulturen des Planeten kennen zu lernen und dann zu realisieren, dass in unseren Herzen – Wir Alle EINS sind. Die Liebe ist der Klebstoff, der uns und alle Materie zusammenhält. Alles im Universum ist verbunden und in Bezug zueinander. Die Mayas sagen: IM LAKESH, was bedeutet: Ich bin ein anderes Du. Kyria Aluéla Lumina widmet sich der Verbreitung von bedingungsloser Liebe, Wahrheit und den benötigten Frequenzen, die es braucht, um die Menschheit auf die nächst höhere Stufe ihrer göttlichen Evolution auf der Erde zu bringen. In ihren Lehren bringt sie alles Wissen in ihrer eigenen wunderbaren, humorvollen und mitfühlenden Weise zusammen. Sie unterrichtet Bewusstseinserweiterung und spirituelles Bewusstsein, leitet Heilungs-Kreise, Meditationen, Schwingungs-Klang- Gruppen und bietet private Konsultationen an. Kyrias Gesangskunst ist jetzt mehr und mehr ihr Weg. Ihre Mehr-Oktaven-Stimme, die über 5 Oktaven geht, ist magisch und mystisch. Ihre Stimme wird zum Instrument des Göttlichen. Die Gesänge, die sie überträgt, sind von einer anderen Welt – dem Reich der Klänge – aber auch aus vielen Kulturen der Erde und der Sterne. Sie chantet Soundeffekte der Natur, Tiere und Geister, die man in dieser Zeit auf SOUNDCLOUD hören kann. Sie singt die Stimmen der Ahnen wie sie sie hört und sie durch sie singen. Kyria Mystica hört auch die Musikklänge der der alten heiligen Tempel, Ruinen, Orte in der Natur, der Sterne und andere Wesen von fernen Planeten in ihrem Kopf, die sie durch ihre Stimme channelt. Sie singt in der Licht Sprache – die kosmische Sprache von Silben und Vibrationen. Das ist die Sprache, die sich vor allen anderen Sprachen bildete. Kyria weiß intuitiv, welchen Klang ein Klient benötigt, um sich zu erinnern, wer er wirklich im innersten ist, und welcher Sound Blockaden löst, befreit und bei dem Selbstheilungsprozess einer Person oder eines anderen Lebewesens hilft. Klang umgeht den Verstand und erreicht direkt die Seele. Klang ist ein schnelles und sehr effektives Werkzeug für die Transformation und Heilung. Der physische Körper besteht aus Klangschwingung und ebenso aus Licht, und reagiert schnell auf Klänge. Die Seele versteht die Sprache der Klänge und sendet ein Signal an den Körper, wenn die richtigen Klänge in den Lichtkörper, die Aura und Chakren installiert sind, die dann Körper und Geist harmonisieren. Kyrias Stimme und Musik öffnet und berührt erstaunlich kraftvoll die Herzen der Menschen. Sie hebt sie in wenigen Minuten in eine höhere Ebene des Bewusstseins. Ihr Publikum fühlt bei Veranstaltungen und Konzerten dass eine Verschiebung und Heilung geschieht. “Sie hat uns repariert und aufgerichtet”; “Ich fühlte, wie Dinge von meinem Körper wegschmolzen”; “Du hast meine Seele berührt”; “Ich weinte vor Freude”; “Irgendwie hat meine Seele diese Sprache verstanden”; “Ich fühle mich mehr in Frieden” ……. Sitzungen mit Kyria Aluéla sind Kraftvoll, aber dennoch unter liebevoll sanfter Einbeziehung der Holomatrix Heilung mit Licht und Ton. Die Blume des Lebens Hologram der Liebe ist ein sehr kraftvolles und wirkungsvolles Werkzeug zum Heilen. Kyria arbeitet mit vielen Aufgestiegenen Meistern, Engeln und persönlichem Geistführer und natürlich auch mit der Seele Jesus – Sananda, sowie Buddha und Gott. Sie hilft bei der Harmonisierung von Körper, Geist und Seele durch die Unterstützung bei der Freisetzung von alten Wunden, nicht dienlichen Denkmustern und schmerzhaften Emotionen durch Übertragung der göttlichen Energie, heiligen Codes, Holomatrix Heilung und channelt Gesänge, die sie als “Das Lied Deiner Seele” benennt. Jede Person erhält einzigartige Klänge und gechannelte Botschaften und Affirmationen. Sie kann sich mit Ihren Lieben auf der anderen Seite verbinden und persönlichen Geistführern, um ihren Klienten eine Nachricht zu geben. Am Ende einer Sitzung fühlt sich jeder leichter, friedlicher und zu seinem wahren inneren Kern, seinem höheren Selbst und der Quelle allen Seins zurückverbunden. Sitzungen erhalten Sie per Telefon, Google HANGOUTS oder Konferenz-Meeting oder in Person wo sie eben ist. Hinterlassen sie Ihre Kontaktdaten – einschließlich E-Mail, und sie wird Ihnen antworten, wann und wie Sie einen Termin vereinbaren können. Seit neuem bietet Kyria Alu’ela Beratungen um den Vereinigungsprozess mit dem Zwillingsflamme zu verstehen und sie kann mit dir einigen methoden teilen, um sich mit dem Dual zu verbinden. Schreibe ihr eine email für diese art von Beratung. Dann kann man weiter sehen die Sitzung buchen kann. Jeder is aus Klang entstanden u hat eine Blaupause der Seele in Klang u Lichtsprache. Die Seele ist wie ein Diamant in höherer Dimension – es ist ein Feuer der Liebe, das einem heilt wenn man wiederverbunden ist. Kyria Channelt ihre eigenen Diamant-Seelen-Codes( Kodierungen), dass ein Schlüssel zur Seele so zu sagen ist und einem wiedervereint. Kyria führt ab 2015 Heilige-Stätte-Touren und Veranstaltungen durch , besucht Heilige Orte und Kraft Plätze in Peru, Mexiko, Griechenland und der Türkei, Portugal und Ägypten , wo sie persönliche Verbindungen zu den wichtigsten geistigen Führern, Schamanen, Archäologen, Reisebüros und Reiseführern hat. In 2015-17 bietet sie Touren in Verbindung mit Seminaren und Retreats mit anderen Förderern an. Diese werden im Jahr 2015 bekannt gegeben. Kyria Aluéla lehrt Lichtkörper-Aktivierung für den Aufstieg und Holographische Heilung, sowie die “Intuitive Stimme” Kurse, wo man lernt, zur eigenen Seelen Stimme durch das Chanten zu gelangen. Melchizedek Methode TM Merkaba & OMkabah Lehren & Schlüssel zum Aufstieg, L 1- 5, so wie weitere Lehren danach. Diese Weisheitslehren sind die modernsten spirituellen Technologien mit der Blume des Lebens Hologramm, der Heiligen Geometrie und Alchemie der Liebe. Das ist, was wir jetzt für den Aufstieg benötigen, was uns von Thoth/Enoch, Sananda, den Melchisedeks, Aufgestiegenen Meistern, den galaktischen Räten, Gaia und JHWH zugeführt wird. Das OM-KABAH ist die neuere erweiterte Version des MERKABA. Sie enthält den Klang OM, neue DNA-Aktivierungen, Metatronische Lichtcodes (Kodierungen) und andere Werkzeuge, um aufzusteigen. Der Adam Kadmon ist der Name unserer menschlichen Blaupause der Schöpfung Gottes. Es ist ein Regenbogen Lichtkörper aus farbigem Licht und Klängen. Wir sollen uns jetzt damit verbinden und ihn herunter ziehen um damit eins zu werden. Dadurch sind wir dann aufgestiegen. Melchizedek Methode lehrt auch ein kraftvolles ,telepathisches, HOLOGRAPHISCHES HEILSYSTEM, wo der Teilnehmer ein Zertifikat bekommt als Praktiker der Methode. Kyria ist ein Vokal-Kanal( Vokal-Channel). Der Klang der durch Kyrias Stimme fließt, erreicht das höhere Bewusstsein des Menschen – die Seele. Der klang strömt auch zur Erde, anderer Planeten, Tiere und Pflanzen. Kyria unterrichted ‘Die Intuitive Stimme’ und leitet Meditationen, in denen sie andere mit speziellen Mantren, Tönen und diversen Werkzeugen zu ihrer eigenen Seelenstimme führt. Dies ist eine natürliche, intuitive Form der Stimmarbeit, nicht wie die klassische Ausbildung in der Stimmbildung. die ihre gechannelte Vokalmusik aufzeichnet und Konzerte gibt. Ihre Musik ist eine Mischung aus Klängen aus aller Welt und dem Kosmos. Sie singt alte Gesänge, ethnische Melodien und kosmische Töne der Sterne in der Stern Sprache oder der Sprache des Lichtes – die Sprache Gottes. Melodien in vielerlei Stimmen und Schallschwingungen fließen spontan durch ihre Stimme, wenn sie ihre eigenen Kompositionen im Augenblick erschafft. Sie verzaubert und heilt ihr Publikum, da Schallschwingungen durch Umgehung des rationalen Verstandes das Herz und die Seele erreichen. Die Seele versteht die Sprache der Musik, da die Seele und der Körper selber Vibrationen sind. Kyria improvisiert und zeichnet auf mit Top-Musikern. Die Stimme von “Kyria Mystica” wird man bald auch in Filmen hören. Ihre erste CD wird im Jahr 2015 veröffentlicht werden. * Man kann eine 1-stündige private Sitzung dafür buchen. Dieser Name wurde von den Melchisedek Meistern des Lichts zu Kyria gegeben. “… Eine Bruderschaft der Menschen – Stellen Sie sich vor kein Besitzrecht … Stellen Sie sich vor, alle Menschen teilen die ganze Welt … und die Welt wird Eins sein”. Schreiben sie hre Kontaktinformationen wie E-Mail, Telefonnummer. Mann kann sie auch über ihre Facebook Seiten unten anschreiben. Sie wird dann mit Ihnen für weitere Informationen, und wie man eine Sitzung, Unterricht, Kurse buchen kann Kontakt aufnehmen. You wrote me the above message a while ago. I don’t know who you are but what I do know is that I love as we are One and the same. I believe in Divinity.